If you have an online store, there’s a good chance people are searching for your store name + ‘coupon code’. They’re looking for deals, so why not treat your customers with an occasional coupon code? *coupon codes that require minimum amounts purchased before becoming active. Setting up a coupon code on Magento is simple once you know how to navigate around the admin pages and through this blog, we’ll teach you the simple steps on how to create coupon codes. 1: Log into your Magento admin panel. 2: Hover over *Promotions* and select *Shopping Cart Price Rules*. 3: Click *Add New Rule* on the top right. 4: Now we need to fill out the rule information tab. a) We begin by filling out the **Rule Name**. This should be something relevant to your discount. For example, “$5 off if spending $20.00 or more”. c) The next item is **Status**. This is self-explanatory and will determine whether the coupon code is active or not. d) **Customer Groups** are the types of customers that you want the coupon code to apply for. Sometimes you may only want to give coupon codes to customers who have a membership on your Magento site. In our case, we want to allow anyone to use the coupon code, so we will select them all. In order to do this, hold the key Control (Command if you’re on a Mac) and individually click all the available options. e) For the next field **Coupon**, we want to select *Specific Coupon* so that the user can enter in a coupon code. If we left it as *No Coupon*, the discount will automatically apply if conditions are met (we will explain conditions later). So let’s enter ‘5off’. f) **Uses per Coupon** specifies how many times a coupon code can be used. g) **Uses per Customer** specifies how many times a particular customer can use a coupon. h) **Priority** is for assigning number to designate whether this new coupon will have priority over other coupons that meet the same rules with the lower number taking precedence. i) **From Date** is where we specify what day we want this coupon code to take effect. j) **To Date** is where we can specify when the coupon code will end. This will automatically end the coupon on the specified “To Date” at 11:59PM. For this example, we wanted our coupon code to end at September 1st, so we will select that date on the calendar. k) **Public In RSS Feed** allows you to set whether or not you want the coupon code in your RSS feed. 5: We can now move into the **Conditions** tab. Here we have a lot of flexibility to ensure that the coupon code will fit our needs. For this example, we want to check if the customer is spending $20.00 or more. a) So we begin by selecting the little green plus icon. A drop down will appear and we want to select *Subtotal*. c) Finally, we want to select the ellipses (…) and enter in $20.00. 6: Next we want to go into the **Actions** tab. b) **Discount Amount** will be 5 since we are taking $5.00 off. c) **Maximum Qty Discount is Applied To**, because we have our coupon code set to affect the whole cart, we do not need to set a maximum quantity for the discount. 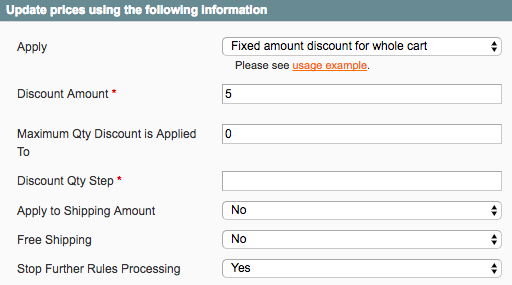 This field is useful if you want to limit the coupon code to one or two items in the cart. d) **Discount Qty Step (Buy X)** is for when you want to create promotions like buy BOGO (buy one get one free). e) **Apply to Shipping Amount** this simply means that the coupon discount will also apply to the shipping costs. For our example, we will leave it as ‘no’. f) **Free Shipping** we can also leave as ‘no’ because this rule is use for determining whether or not it is for free shipping. g) **Stop Further Rules Processing** determines if this coupon code will override and prevent other coupon codes/rules from working. Typically if we want our customers to only be able to use one coupon code, we will set this to ‘yes’. h) **Apply the rule only to cart items matching the following conditions (leave blank for all items)** is for more conditionals targeting specific items. In our case, we want the coupon code to apply to the whole cart so we can leave it blank. 7: The final tab is **Label**. This tab is what may show up on the front-end of the website when the user applies the coupon. I used the word ‘may’ because depending on the architecture of your Magento website, the coupon label sometimes will not show up. So now that you’re comfortable with creating a coupon code, let’s dive a little deeper. We want to now create category deals. 1. We want to navigate to “catalog price rules” which is under promotions in the navigation bar. 2: Next we can begin by filling out the fields that were mentioned before. c) We are going to follow by making this rule **active**, select **all** customer groups and leave the priority and from/to dates empty because we do not want the category deal to expire and standard priority is fine. d) Next we want to enter the **conditions** tab on the left and set the conditions in which this catalog price rule will apply. So to do this, we need to select the little green plus and select *category* in the drop down. We then need to leave the parameter as *is* and select the ellipses and specify the category that we want this catalog price rule to apply to. e) Next we want to move into the **actions** tab and apply the rule as *By Percentage Of Original Price*. Following this, we want to set the discount amount to *20*. And we will leave *Enable Discount to Subproducts* and *Stop Further Rules Processing* as *No* because we do not have sub products and incase we have a free shipping promotion set up, we do not want to stop further rule processing. f) The final step is to *save and **apply*** and you will see the catalog promotion applied on the front-end. Here we will go through the process of creating a BOGO coupon that only applies if you use the coupon code and meet the required conditions. 2. We need to proceed by filling out appropriate fields. a) For this example, we are going to name our coupon “BOGO if spent $20 or more”, set status as *active* and select all customer groups. 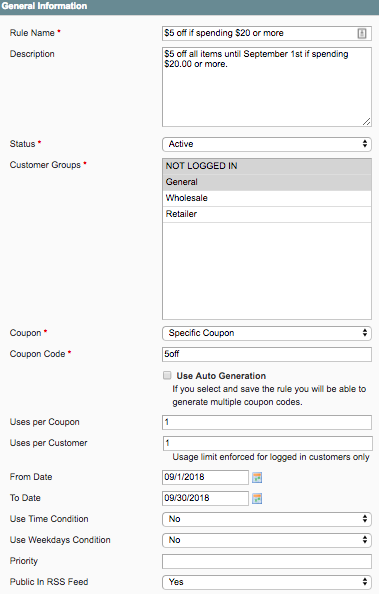 b) Next we want the custom to use a coupon to get this deal so we will select “Specific Coupon” for the coupon field. c) To keep things simple, our coupon code will be “BOGO” and the rest of the fields we will leave empty. e) Now we can move into the **Actions** tab and change the coupon to *Buy X get Y free (discount amount is Y)*. We can set the *Discount Amount* to *1* because that is our Y value. We can follow by setting *Maximum Qty Discount is Applied To* to *0* and *Discount Qty Step (Buy X)* to *1* because we want the customer to buy 1 item for this to work. The catch for this is that Magento only supports this type of discount only if the same item is being purchased. However, here at Ready Artwork, we do have different solutions for this problem and will be able to find a way to help. Here we will go through the general process of creating a coupon code that works when you purchase an item with a specific attribute. This coupon code relies entirely on how your products are set up. a) For this example, we are going to name our coupon “Attribute Deal on X Attribute”, set status as *active* and select all customer groups. b) Next we can move into **Conditions** tab and select the green plus icon followed by *Attribute Set* next we want to leave “is” as the default conditional check and select your desired attribute from the ellipses. c) Now we can move into the **Actions** tab and leave the first item as *By Percentage of Original Price* and set the discount amount to *20*. This will allow all items in that attribute to have a 20% off discount. d) All that’s left to do is to save and apply so the discount will take affect. Here we can go through the process of creating a coupon for free shipping after x dollars spent. a) For this example, we are going to name our coupon “free shipping after x $ spent”, set status as *active* and select all customer groups. d) After that, we can move to the **Actions** tab and because this is a coupon code for free shipping, we can leave the Apply field as *percent of product price discount*. We can follow by setting *Discount Amount*, *Maximum Qty Discount is Applied To*, *Discount Qty Step (Buy X)*, to *0* and *Apply to Shipping Amount*, *Stop Further Rules Processing* to *No*. The most important part of this step is to set *Free Shipping* field to *For shipment with matching items* so that the coupon code will apply the free shipping discount whenever the conditions are met. 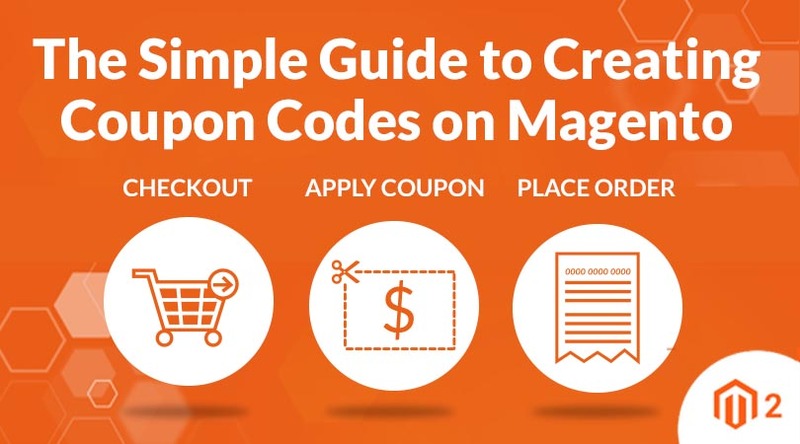 You can now be able to effectively create a coupon code for your Magento website or at the very minimum have the general knowledge of how the coupon code system works in Magento. If you are still having trouble with coupon codes or anything else related to your Magento website, feel free to contact us and we will be happy to help!